The A.L.E.R.T. (Animal Location Evasive Response Technology) system is designed to detect animals crossing or present in a roadway and alert drivers to their presence before a collision occurs. The system uses cameras, optics, infrared illumination, and a computer to gather and analyze digital imagery. 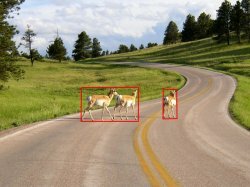 Advanced proprietary machine vision algorithms have been developed to detect animals, track their position, and to distinguish between animals, background plant life, and automobiles. The system can operate during the day using ambient light and at night using the attached infrared illuminator. Upon detection of an animal a signal will be generated to flash a beacon or warning signal to approaching motorists. Animal-vehicle crashes are a significant problem on the nation’s roadways, accounting for approximately 726,000 vehicle collisions annually . Hundreds of millions of dollars are spent each year for crash-prevention measures and post-crash repair/cleanup. Intelligent Transportation Systems (ITS) initiatives have focused on advanced technology solutions to transportation system problems. 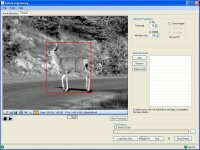 The limited technologies available for roadside animal detection are only effective for short-range detection. 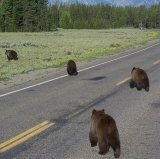 Most marketed systems are limited in coverage, provide low background contrast, or visually distract drivers with unsightly continuously flashing lights, wildlife warning reflectors, mirrors, or wildlife fences. • Distinguish between an animal, an automobile, and plant life. • Remote monitoring from a central location via the internet.